The small-dollar donor movement reached new heights in April as more folks used grassroots donations to fight back against the GOP on multiple fronts. 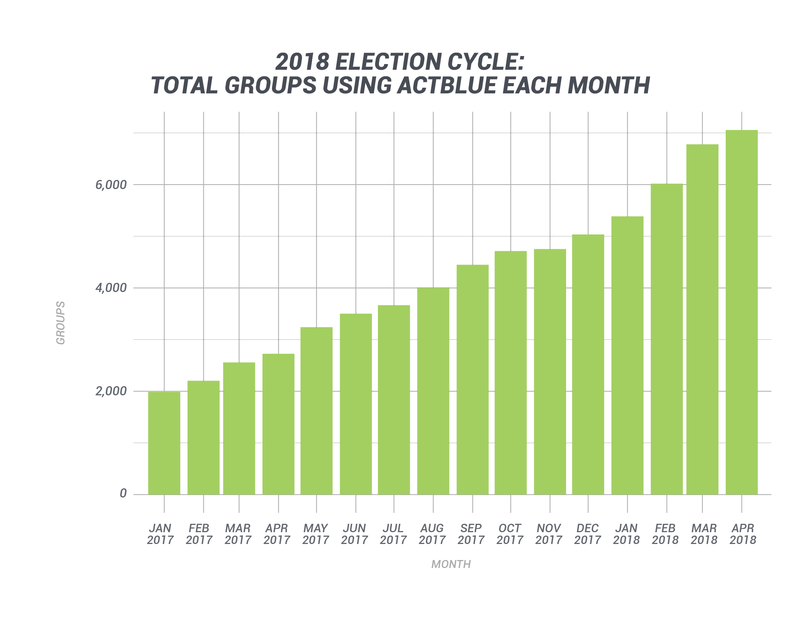 Over the course of the month, donors supported a record-breaking 7,056 campaigns and organizations on ActBlue. These are groups working across the country on a wide variety of progressive issues and people running for all levels of office to create positive change in their communities. This is the first time we’ve had over 7,000 groups use our tools in one month, and it’s even more exciting because our total for all of 2017 was 7,892 groups! 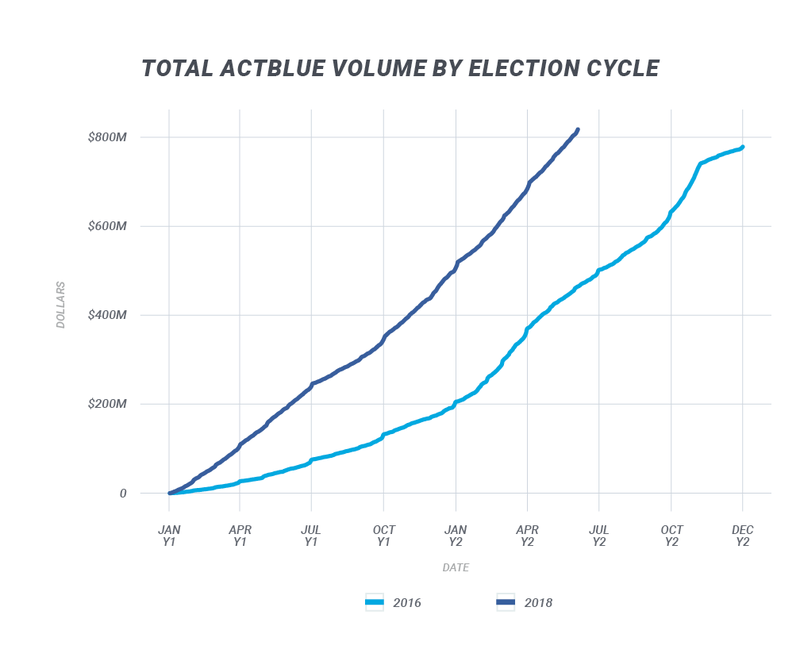 But that’s not all: Grassroots donors raised $55,885,812 on ActBlue in April, which brings our current total for the 2018 election cycle to $758 million. We’re far ahead of the $746 million raised through Election Day in the 2016 election cycle and only slightly behind the $782 million raised over the entire 2016 cycle! 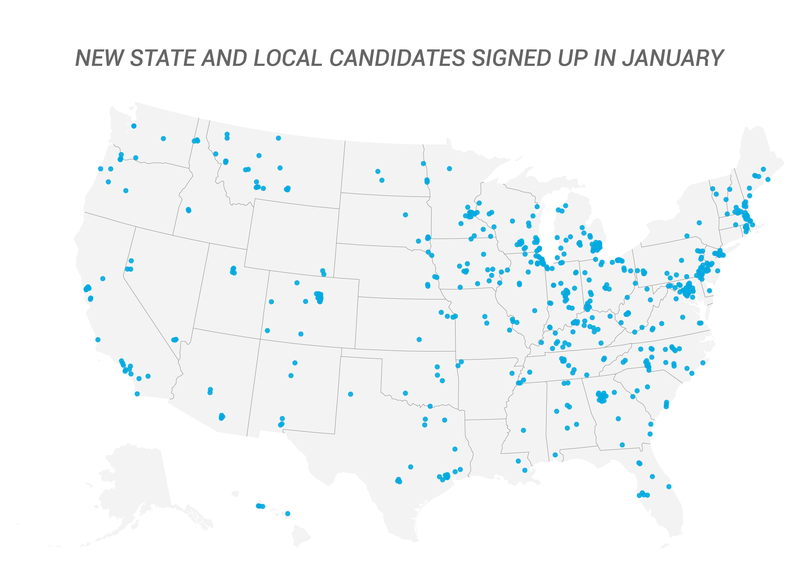 This meteoric rise in grassroots engagement means Democrats running for office this year have an unprecedented amount of early support and are building campaigns that can compete with GOP super PACs and corporate funders for the next six months. 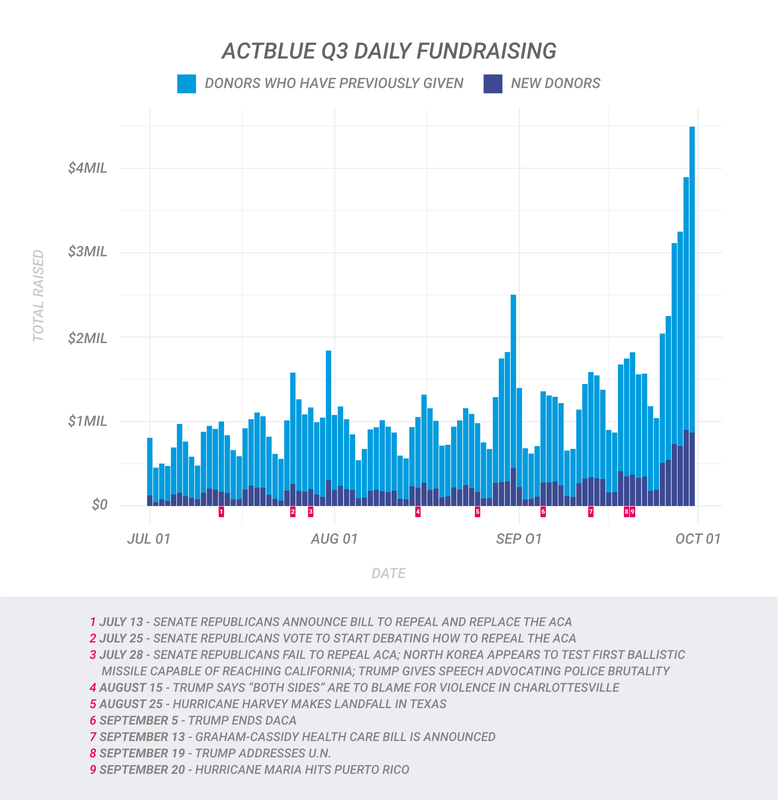 Small-dollar donors made 1,453,311 contributions on ActBlue in April. They supported an extraordinary number of groups using our platform, from folks running for office for the first time to environmental advocacy groups and nonprofits celebrating Earth Day. 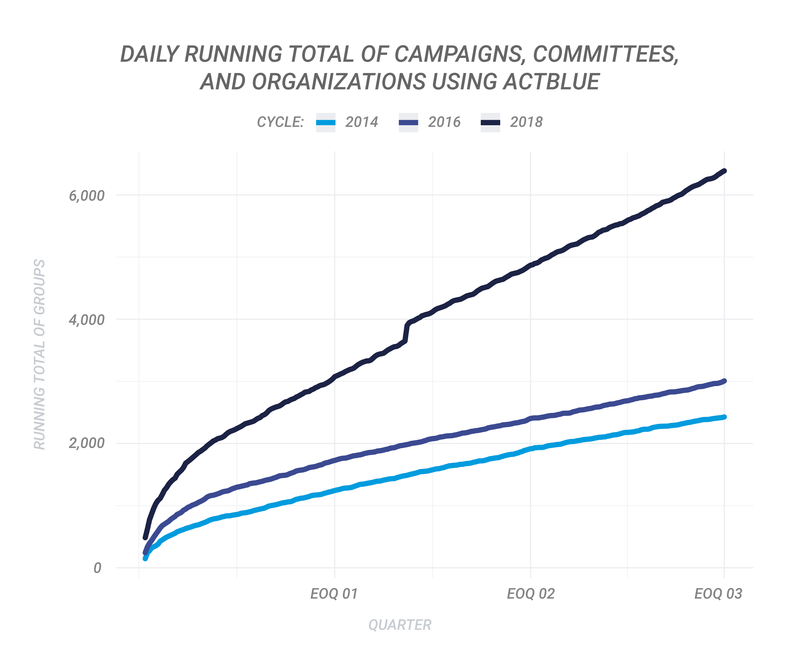 In the chart below, you can see the steady rise in campaigns and organizations using ActBlue over the course of this election cycle. 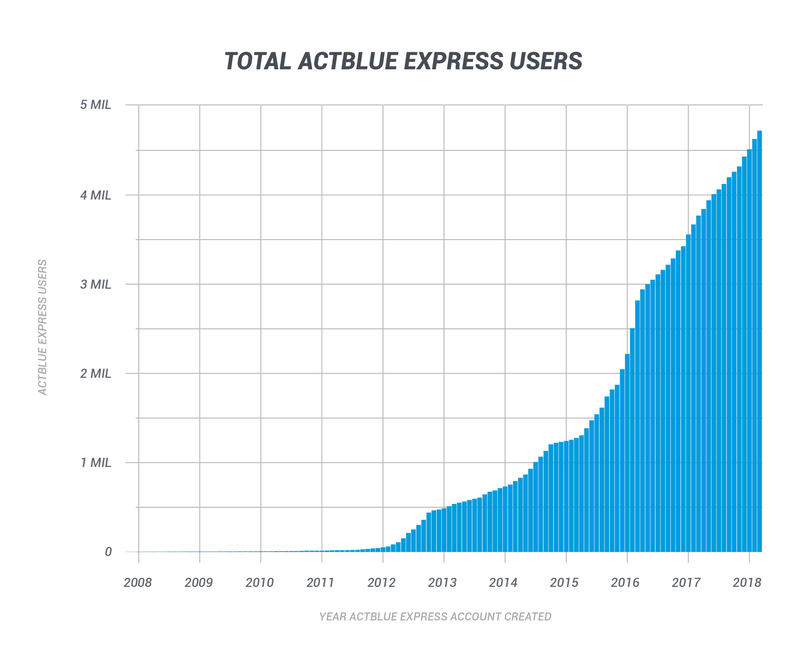 When these groups begin to use ActBlue, they get access to our ever-expanding ActBlue Express universe: A group of nearly 5 million small-dollar donors who have saved their payment information with us so they can give to any group on our platform with a single click. 42.1% of all contributions in April were made via mobile. If you’re a digital fundraiser, it’s crucial to think about how your program works on mobile so you don’t miss out on nearly half of all potential contributions. 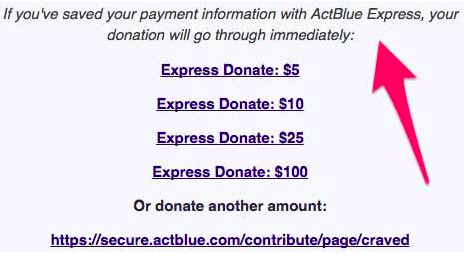 ActBlue contribution forms are automatically optimized for mobile so that supporters can give to their favorite candidates and causes even if they’re not in front of a computer screen. 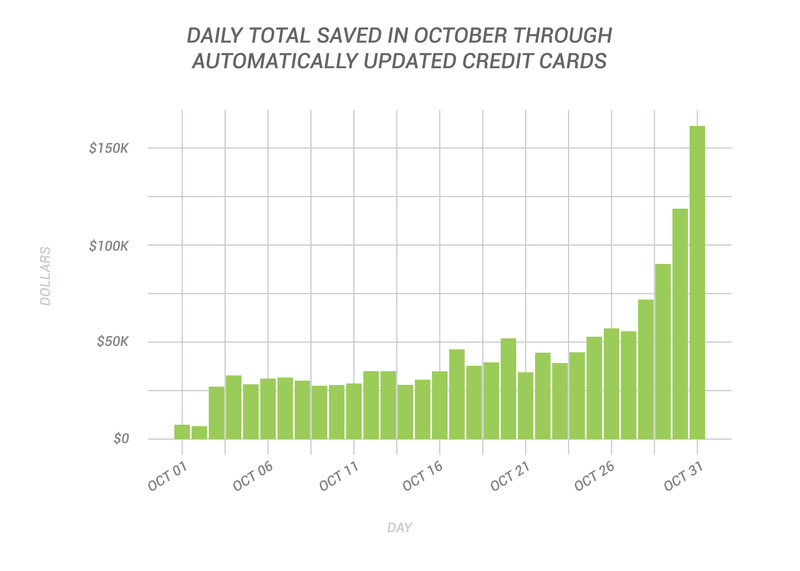 Recurring contributions made up 22.5% of total volume in April. Grassroots donors are committing to Democrats and progressive groups for the long haul. Recurring donations will sustain Dems running against Republicans bankrolled by mega-donors and help advocacy groups and nonprofits budget and plan for the future. If Q1 wasn’t convincing enough, April has made it clear that small-dollar donors are ready to power a formidable blue wave this year. We’re so excited by all of this energy and engagement, and we’re ready to help activists, concerned citizens, candidates, and organizers reach more victories. 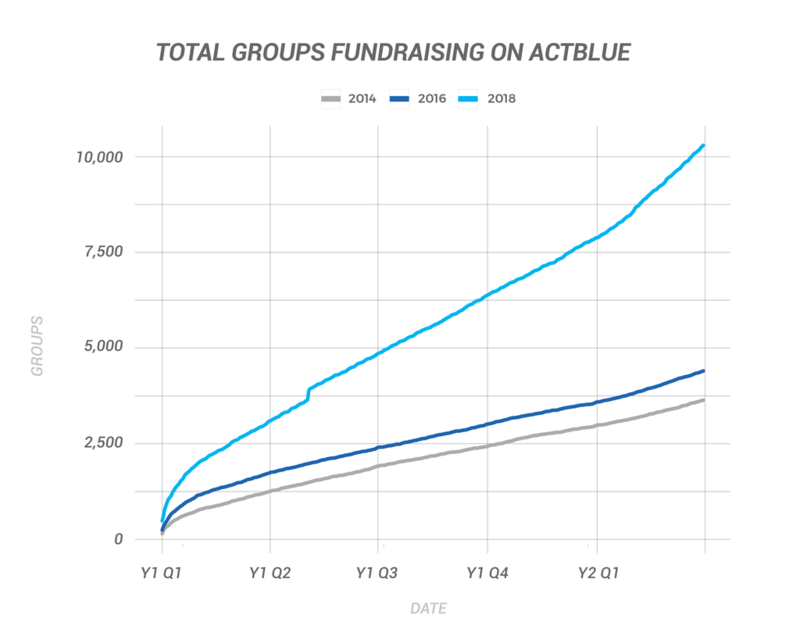 If you want to start raising money for a cause or campaign online, or if you have questions about this post, get in touch with us at info@actblue.com. February was the last month before primary season kicked off, and small-dollar donors took that to heart: They helped Democratic campaigns and other groups on the left raise $59,511,643 using ActBlue. 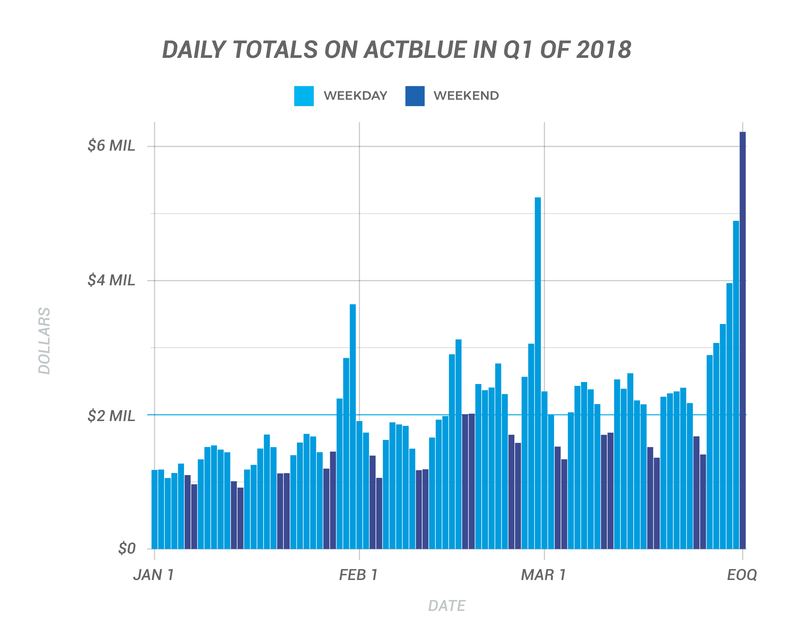 That total beats the previous ActBlue record for February from 2016 by over $1 million. 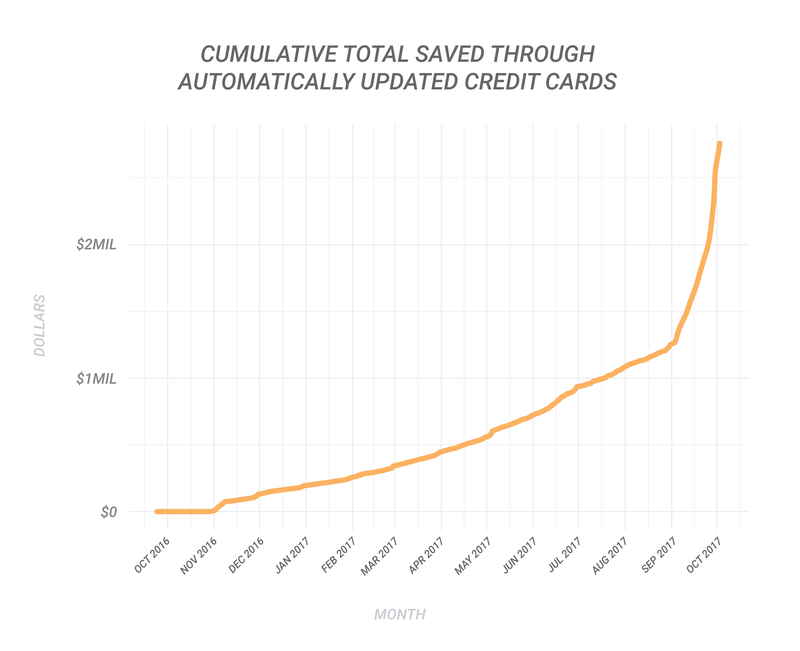 Additionally, the number of unique groups using our tools hit a new high once again: 6,039 candidates, advocacy organizations, and nonprofits! These records are even more impressive because February 2016 was part of a presidential cycle and was also one day longer than last month because it was part of a leap year! 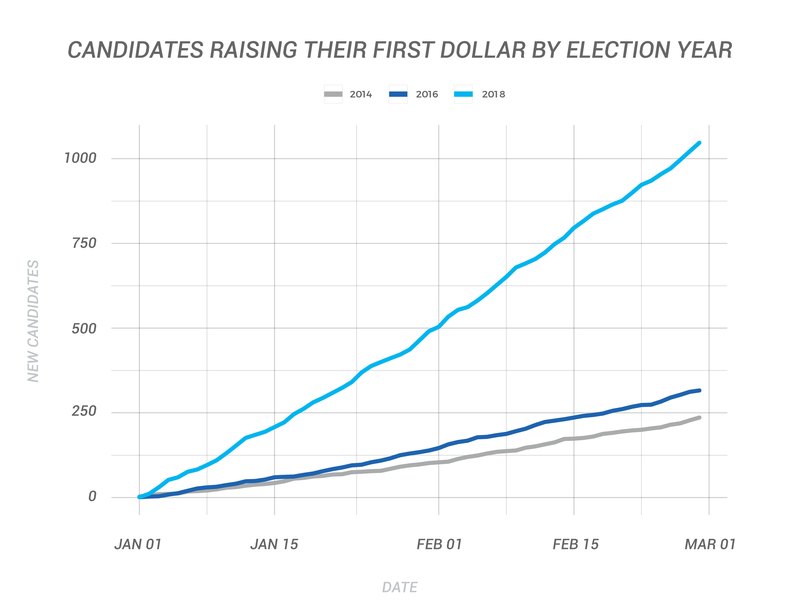 Last month, grassroots donors made 1,606,011 contributions and raised almost fifty million more dollars than in February of the last midterm election year (2014) — that’s a huge increase in engagement over four short years! 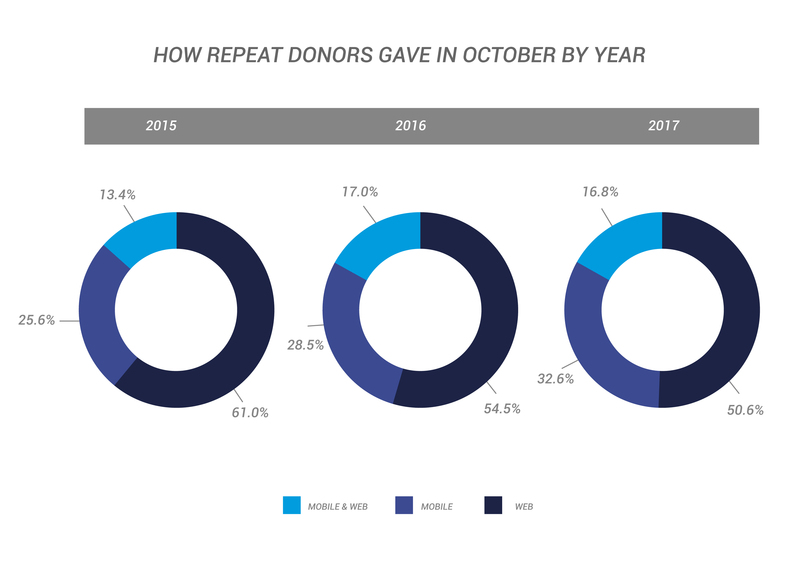 Not only are more donors becoming engaged, more folks are jumping into the ring and running people-powered campaigns. 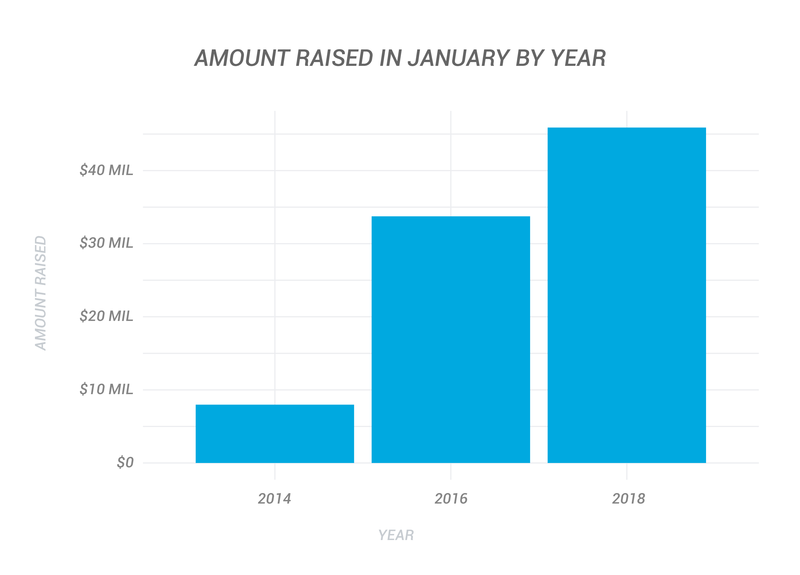 We’re only two months into 2018, and over 1,000 candidates have raised their first dollar for a new (and in most cases, first) campaign. 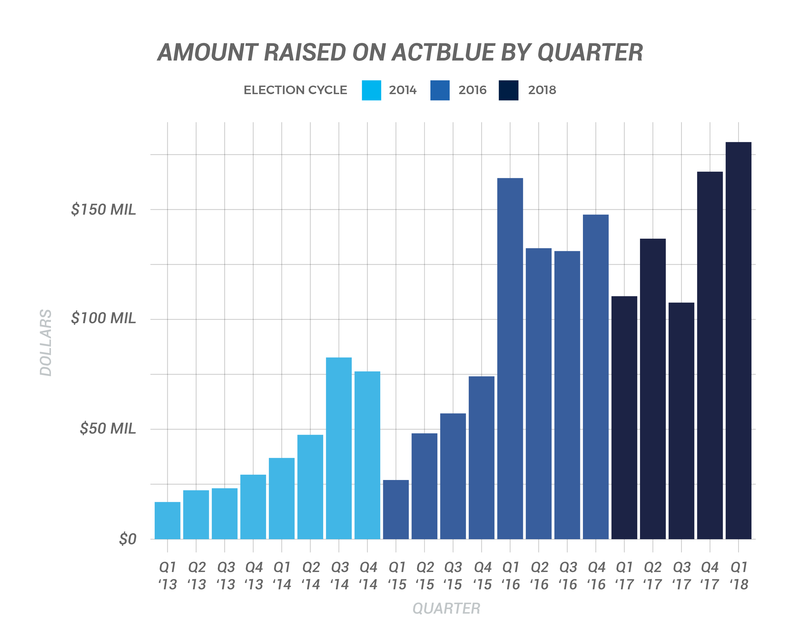 At the end of February in 2014 and 2016, there were fewer than 375 candidates who were raising for a new campaign on ActBlue. 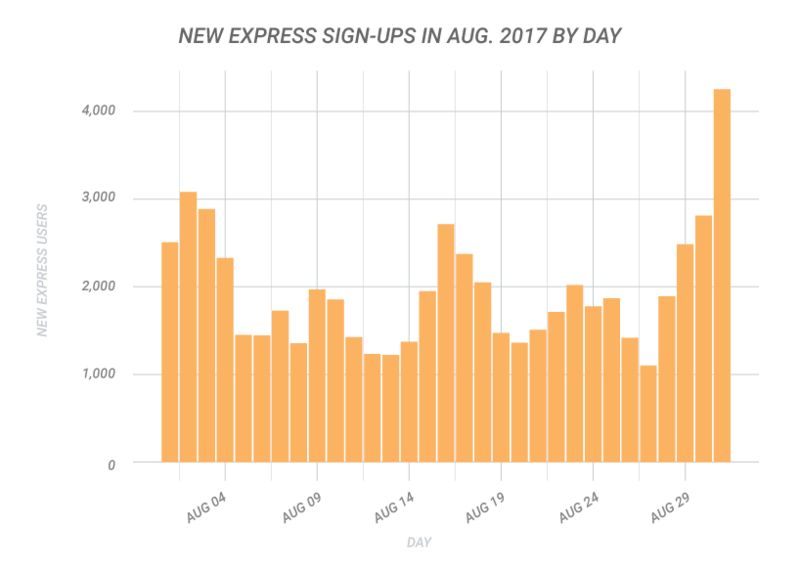 115,471 new users signed up for ActBlue Express last month and can now give to any group that uses ActBlue with a single click. 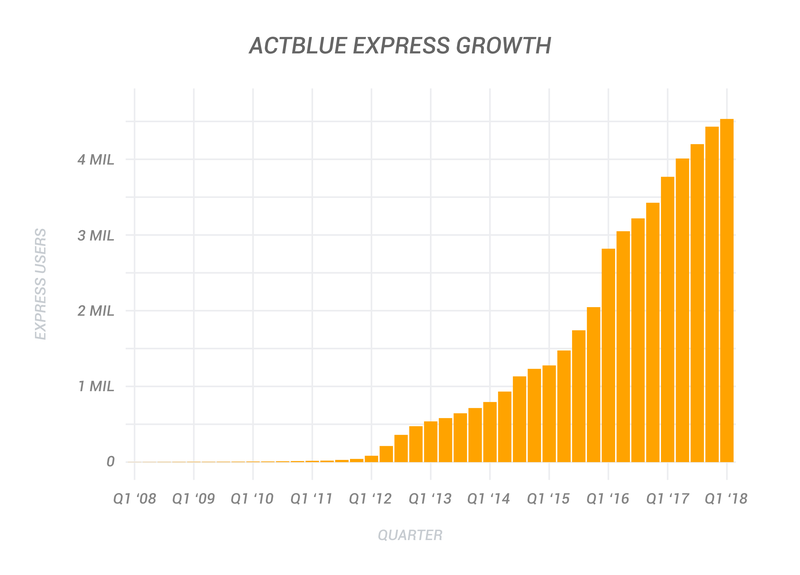 February 2018 is only the tenth month in ActBlue history to have over 100,000 people sign up for ActBlue Express, and it’s the second-biggest month in this cycle (only January 2017 is bigger)! All ActBlue contribution forms are automatically mobile-optimized so small-dollar donors can quickly and easily give on their phones or tablets. 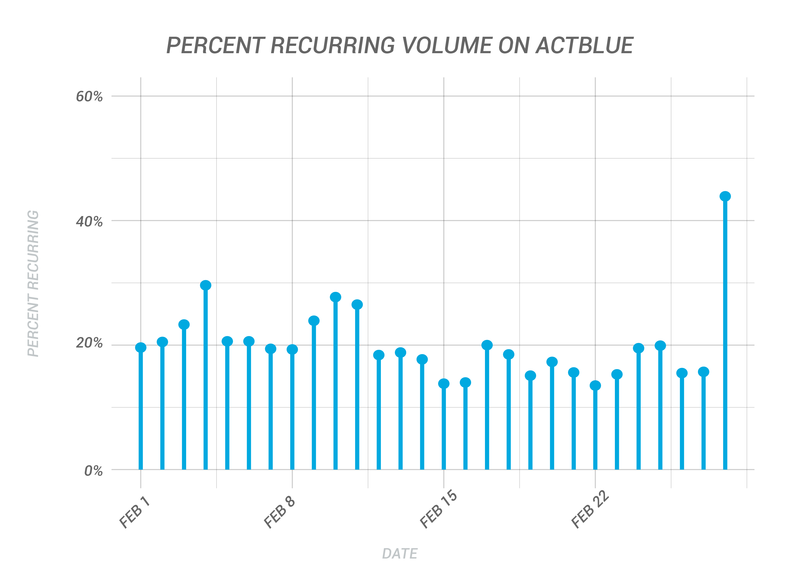 Last month, 43% of all donations on ActBlue were made via mobile. As primary season begins in earnest, it’s more important than ever for campaigns to be mobile-friendly so they don’t miss out on contributions. 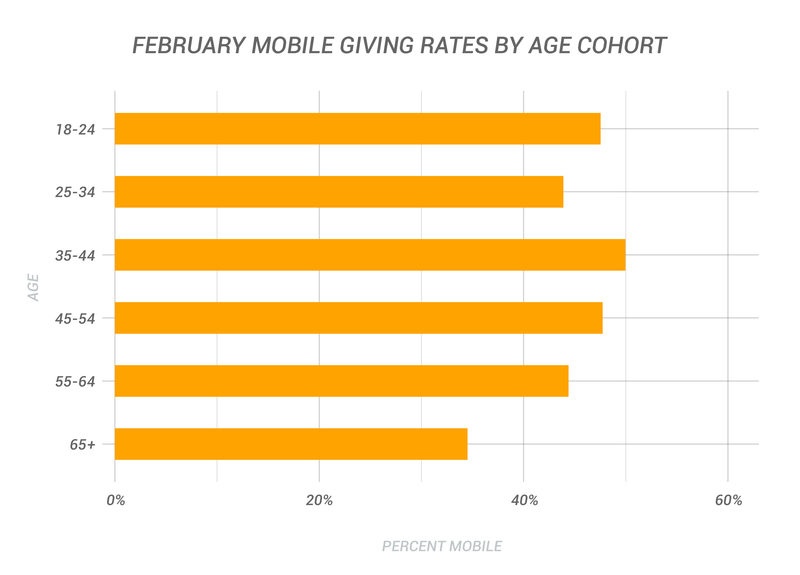 We’ve consistently found that contrary to popular belief, supporters in older age cohorts donate more on mobile than younger supporters. This trend continued across the site in February, as 50% of supporters in the 35-44 age group gave on mobile, the highest rate of any cohort. The 45-54 and 55-64 age groups also beat out the 25-34 cohort, and over one-third of supporters 65 and up gave on mobile. 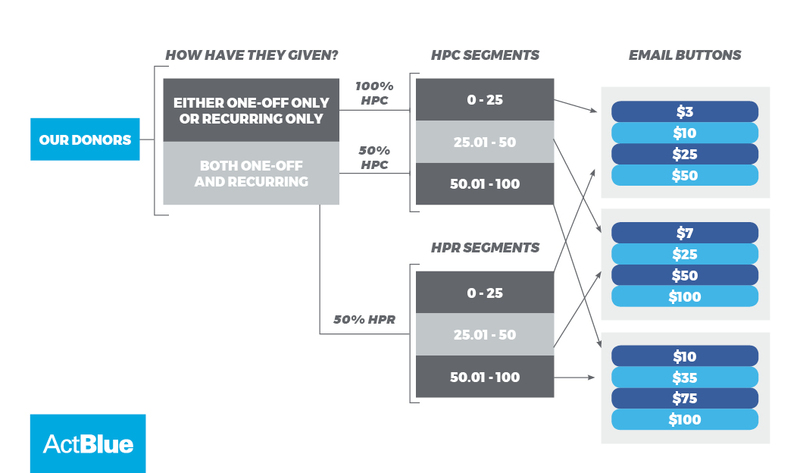 When supporters make a recurring contribution, they enable that candidate or organization to build a roadmap to Election Day. 20.3% of February’s total volume came from recurring contributions, up an impressive 5.5% from February 2016. Now that it’s an election year, recurring donations will play a huge role powering Democrats to victory up and down the ballot. Because it was a short month, we had to process the recurring contributions that typically run on the 29th, 30th, and 31st on the 28th. 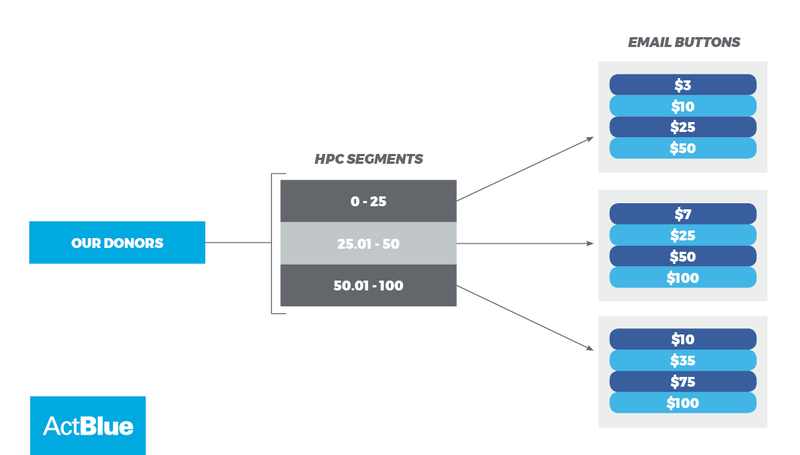 That meant 43.9% of our entire volume for February 28th was recurring! 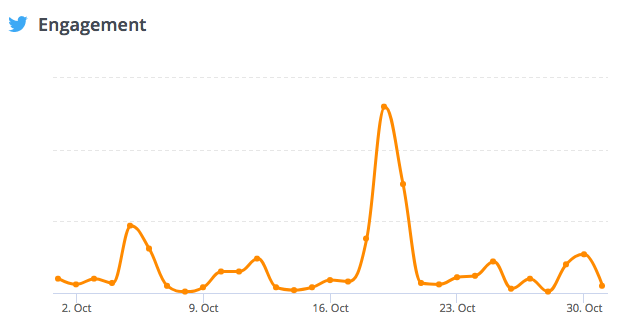 Our tech team is always strengthening our platform so it can handle spikes in volume like this, which you can clearly see in the chart below. We know that more folks are going to chip in as this election year ramps up, so we’re adding more experts to our Customer Service Team. They’re available 24/7 so donors can always get the answers and help they need. 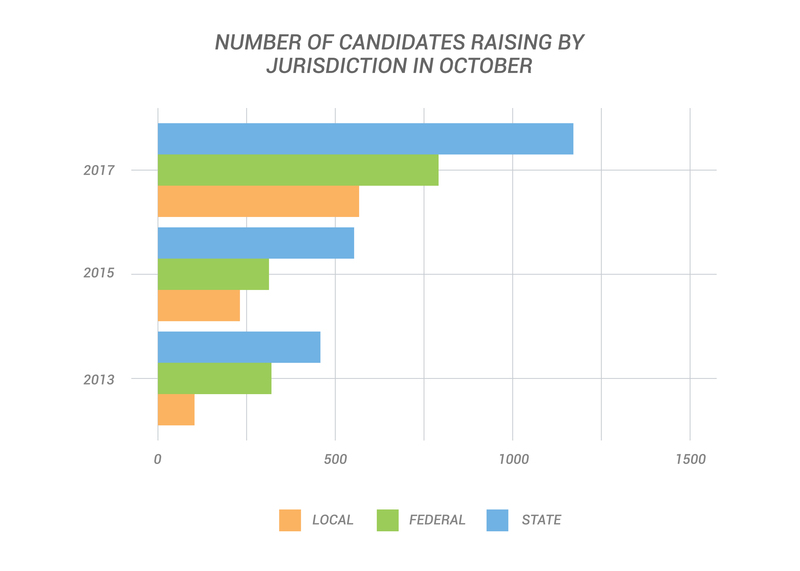 Small-dollar donors are gearing up for a potentially historic election year. If they continue to outpace totals from the 2016 cycle, there’s no limit to what this movement can achieve in November! If you want to fundraise for your favorite campaign or cause, or if you have questions about this post, contact us at info@actblue.com.